~Mrs. Mathis' Homeroom~: BTS 2015 - Classroom Reveal! BTS 2015 - Classroom Reveal! 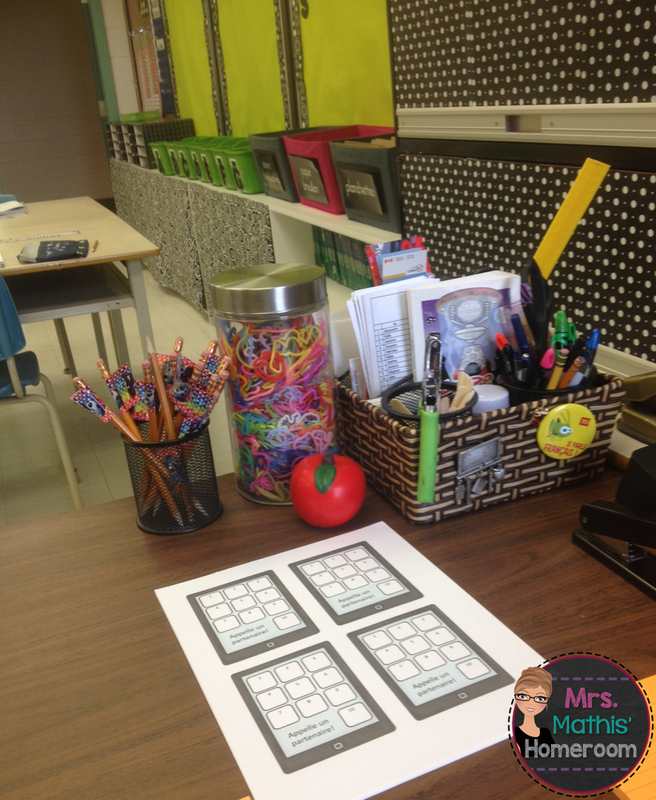 Two more sleeps and we go back to school! I am super excited about this year! I am once again teaching a grade 4 and 5 split class, an age group that I truly enjoy. I have a "small" group of 21 students last year (29 last year! Not sure how I survived it!) and half of them are returning students from last year's Grade 4. 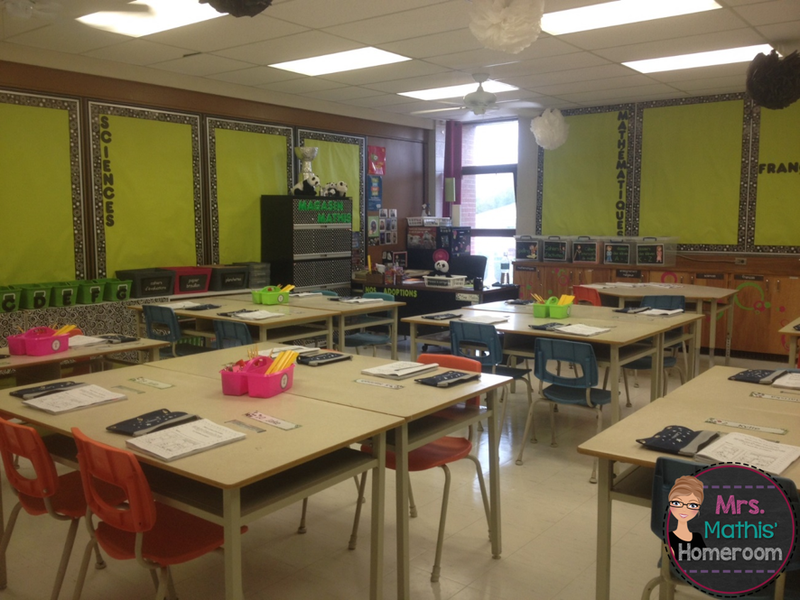 Unlike last year, I was able to only spend a few days in my classroom over the summer, instead of several weeks. That was a real bonus! What you see below are pictures of my desk area. I have pictures of my family, of my past classes (and newspaper clippings!) and a picture of myself in Grade 5. The kids enjoy seeing that one! 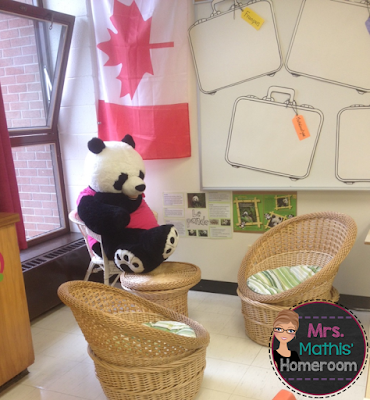 This is Manda Panda, our classroom mascot. 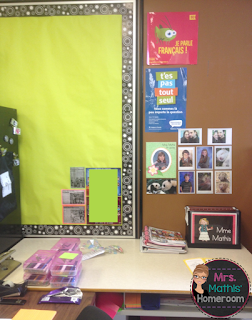 She sits in a special corner of the classroom. Last year, I had a very large room and had her sitting in the reading corner with milk-crate benches and library books. Each week, one row of students were allowed to sit in the reading corner for our reading time. This year, I plan on using these two chairs as a reward for students. One student a week will get to sit there with a friend during our 15 minutes of reading in the morning and in the afternoon. 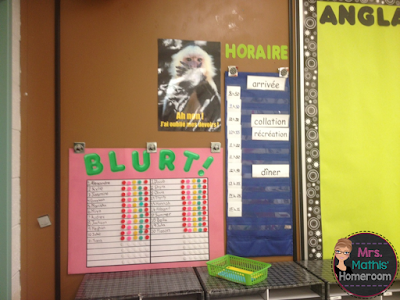 My interactive Word Wall! 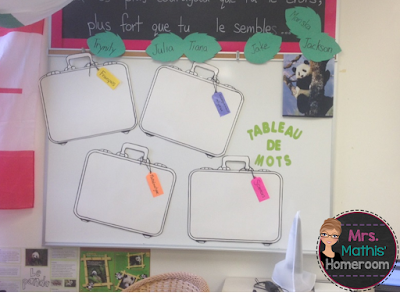 In my school, we are using the Marzano approach, which is why I have suitcases on my board. The kids and I classify our words by subject and we move them around a lot. This is my Learning Goals board. The 10 pizzas are to post work examples at different levels. Students are to aim for at least a pepperoni pizza for every task they hand in for assessment. We come up with the criteria for each pizza together. A view of the student seating area. This year, I'm trying out tables for the first time. Each table has a caddy with the necessary supplies. Crossing my fingers that this will work well! Our schedule, mailboxes and Blurt board! I'm a big hockey fan (Go Habs Go!) 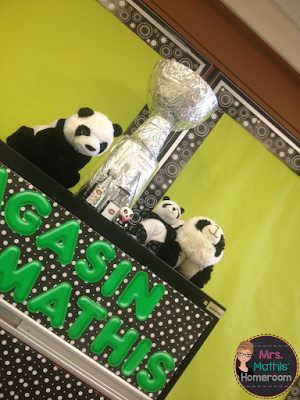 and every Spring, I do a hockey pool in my class and tie it in with data management for math. The kids love to see who gets to predict the winning teams foreach round and the ones who predict right get their names on the classroom Stanley Cup. They get VERY excited about it.This is also where I keep my collection of pandas that were given to me by my students. Everything is on top of my filing cabinet that I use as my reward store. Everything is ready! I hope my students feel welcomed and at home!